Calcium Rich Dessert Recipes, Indian high Calcium Desserts. No wedding, no festival, no celebration, or for that matter no special meal is ever complete without Desserts. Fortunately, this tasty section of the menu can be made calcium-rich too, but with a few deft moves that reduce the fat content so that the calcium is absorbed better. We have made Paneer Kheer which is Diabetic friendly. Then there is the Iron rich Poha Phirni to which you can add apples. Also we present you the ever famous Rasmalai. Kids and Adults both love Butterscotch Ice Cream. Then there is the yummy Fig Ice Cream made with loads of dried Figs. A sweet and slightly Crunchy Apple Custard that will help top up on your calcium requirement. Everybody, from kids to adults, need calcium, but one cannot overdose on bland milk. By including milk along with nutritious and tasty fruits like apple, and flavour-enhancing ingredients like brown sugar, it is possible to transform the dessert from a sinful course of the meal to a guilt-free and healthy one without compromising on taste! You can also try an Eggless Dessert, Date and Custard Dessert or a Cheescake recipe which is good for Diabetics. 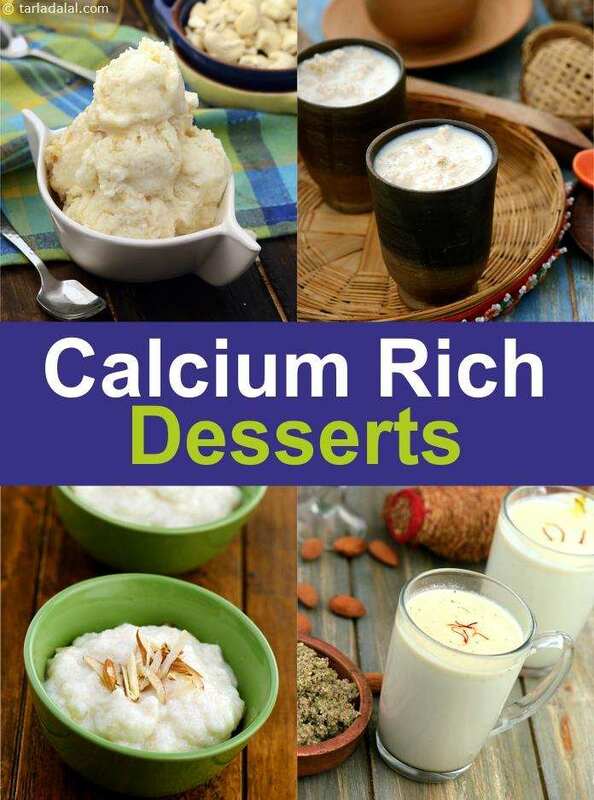 Enjoy our collection of Calcium Rich Indian Dessert Recipes given below from Calcium Rich Breakfast to Calcium Rich Soups. Apple rolls, a healthier version of apple pie that is so flavourful when served with vanilla cream, the little effort that goes into this will earn you multiple times more praise! The dough has been prepared with whole wheat flour that enhances the fibre content. These dainty chenna filled lychees are sure to melt in your mouth. Choose sweet lychees to make this dessert because sharp or acidic lychees are not going to complement the filling. You can have 2 pieces at one time without feeling guilty. Dazzle your kids with these crispy treats as a dessert or for a healthy snack and make up for their calcium requirements.